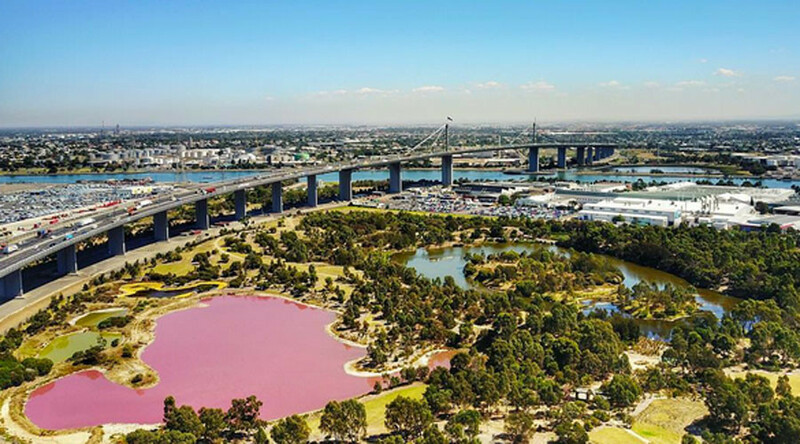 A cocktail of extreme salt levels, algae and roasting conditions has turned a Melbourne city lake a vibrant pink. Authorities, however, are warning people not to take a dip in the warm glowing waters. The sudden color transformation of a Melbourne’s Westgate Park lake from blue to pink has sent shutterbugs, keen to capture images of the candy coloured lagoon, into overdrive. The lake near Port Phillip Bay turns a reddish-pink every year due to “very high salt levels, high temperatures, sunlight and lack of rainfall,” according to Parks Victoria. “Algae growing in the salt crust at the bottom of the lake produces the red pigment as part of its photosynthesis process and in response to the extremely high salt levels,” the parks agency explained. It comes as temperatures in Melbourne hit highs of 33 degrees Celsius (91 Fahrenheit) over the last 10 days. While the lake may look like a pleasant place to swim, people are being advised to stay clear and “avoid direct contact” with the extremely salty waters. The lake is expected to return to its normal blue color come the winter months.